Since having kids and especially since moving to rural Vermont, I have come to realize that celebrating the seasons (and micro-seasons, like lilac-blooming season, blueberry-picking season, and maple syrup season) is not just something to entertain yourself, or your kids. Celebrating seasonal change has actually helped me feel more at peace with the passage of time. Which is no easy task when you have these phenomenal little creatures growing up around you at the speed of light. (By which I mean my children, not some kind of space-time forest of sea monkeys or something.) It’s like, if I have squeezed every last drop of summer-ness out of summer, then it’s not as sudden and tragic as it used to feel when summer is finally over. So that brings us to Midsummer. Which, may I say, is a much more sensible name for it because it feels like the longest day of the year should be the middle of summer, not the beginning of it! Anyhow, we had a day of summery sun and fairy fun, and even my un-naturey photo-nerd husband got in on the action. 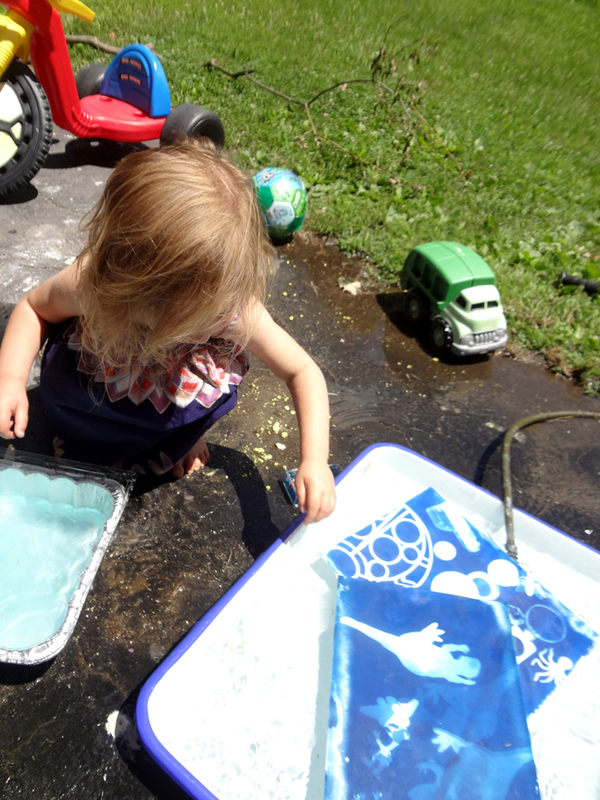 A few days ago he prepared some water color paper to make cyanotypes with the kids. 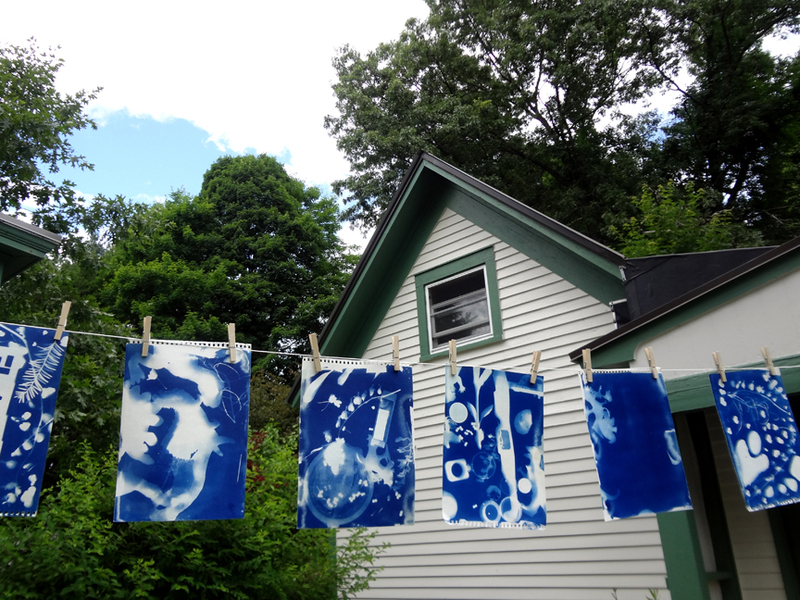 If you don’t know what cyanotypes are, it’s basically the simplest type of photographic process. The paper is the film, and sunlight will turn it blue. If there is something covering the paper, those places will remain white. Once the paper’s been exposed long enough, you wash the blue-making chemicals off the paper in running water, and dip it in hydrogen peroxide to heighten the contrast. And voila! BEHOLD THE POWER OF THE SUN! (In a funny coincidence, I found out after posting this that a local photographer friend also did cyanotypes with his kid this morning. 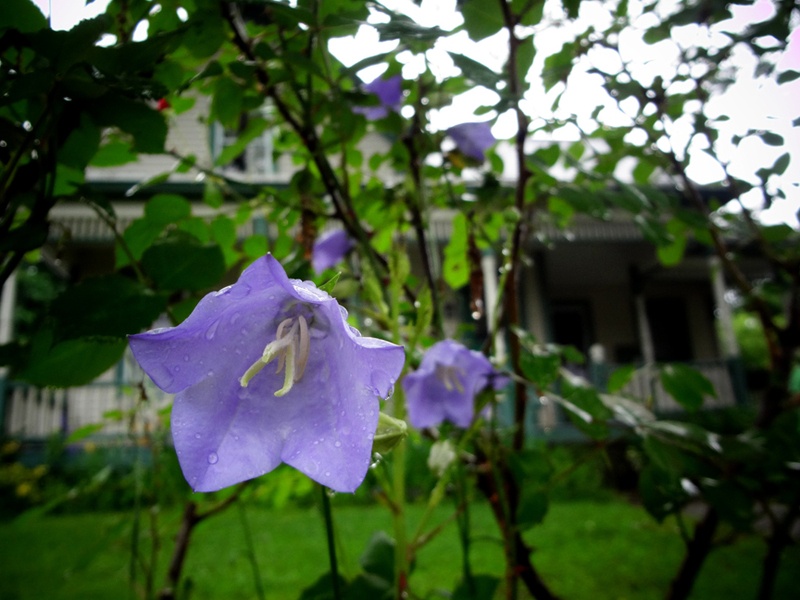 I guess photo dad + hippie paganesque Vermont + June 21 = solstice cyanotypes.) If you want to make your own cyanotypes, here’s the full DIY instructions, including how to make the treated paper, or you can just buy pre-made cyanotype paper. After lunch, we crossed one off our summer wish list by attending a bluegrass concert at the nursing home across from our house. 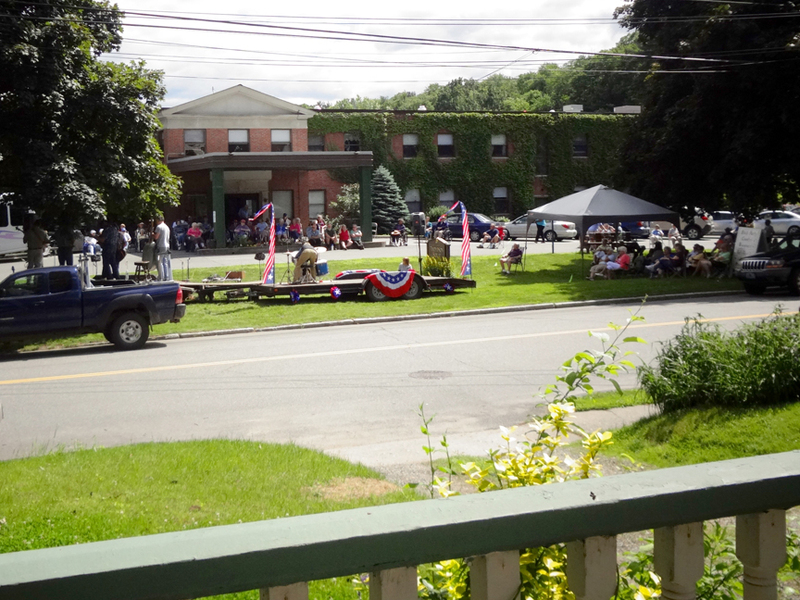 The kids danced and ran around, and when they got too squirrelly, I took them back across the street to get some lemonade from some boys who had a stand on the corner, and then watched the rest while eating snacks from the comfort of our porch. We’re lucky enough to belong to a CSA that offers unlimited PYO herbs, and the kids had gathered a bunch of chamomile on Thursday to make tea with. I truly am raising two little old ladies. 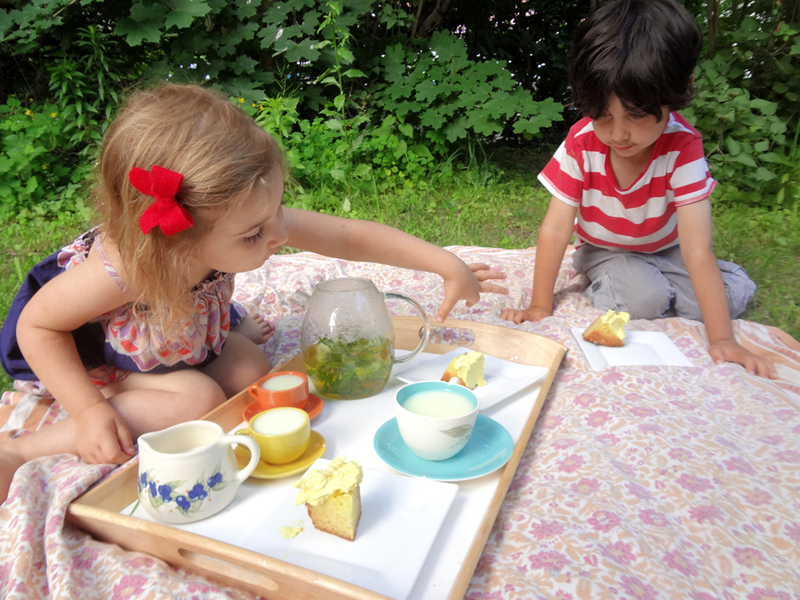 We had our afternoon tea in the backyard with some leftover chunks of cake and frosting from our other morning project – making a sun cake! I came across this Mandarin Orange Cake the other day and when I read this in the description, I was sold: “Most of its charm is deeply rooted in the fact that this cake is not for special occasions. It’s a summer cake, a cake to make at the lake house, or cabin, or eaten while sitting in wet swimsuits while wrapped in beach towels.” I didn’t feel like going out and buying canned fruit and a cake mix, so I just made my go to yellow cake recipe instead, but I’m saving that easy peasy one in my back pocket for a beach vacation dessert. What I did make from that recipe was the frosting – whipped cream frosting, my favorite, with orange zest, and the amazing trick of adding instant pudding to stabilize it! Hallelujah! I mixed in some turmeric for a nice hippie-style yellow color. We cooked and ate dinner al fresco, courtesy of ye olde firepit and some hot dogs from The Chopper, as I affectionately call our local low-rent grocery chain. Mitigated slightly by the local organic salad that sat mostly untouched on the kids plates. Thanks to the funny gardening picture book that I picked up at a library surplus sale back in Chicago, Muncha Muncha Muncha, they do love to eat the hearts of the lettuce, at least. After dinner was as consumed as it was gonna get, I brought out the glorious cake. 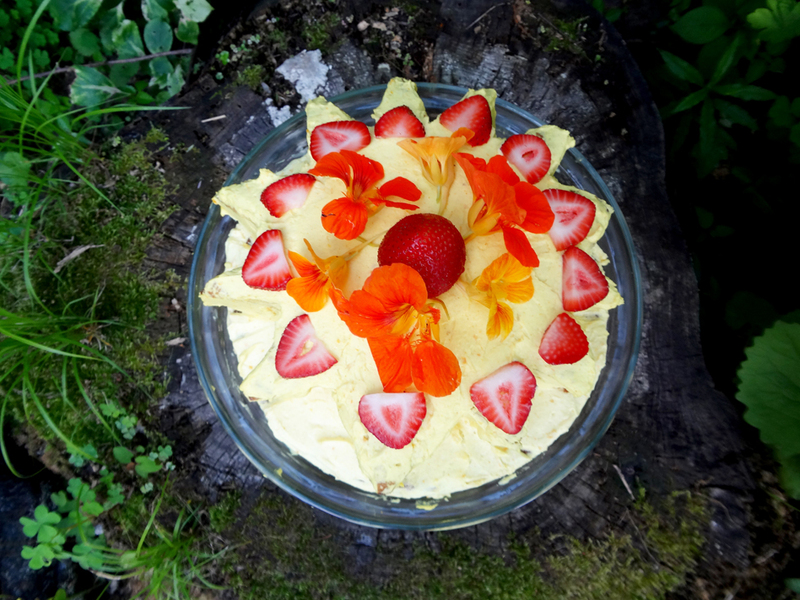 We decorated it with strawberries and some nasturtiums from our garden. Yum! To make the sun shape for the top layer, I just cut a small circle out of the cake, placed it on top of the frosted bottom layer, and then cut triangles out of the remaining ring of cake, placing them around the circle, and then frosted the whole thing. I am not a frosting master, somebody like my cousin Jorie could probably do something phenomenal with this idea. 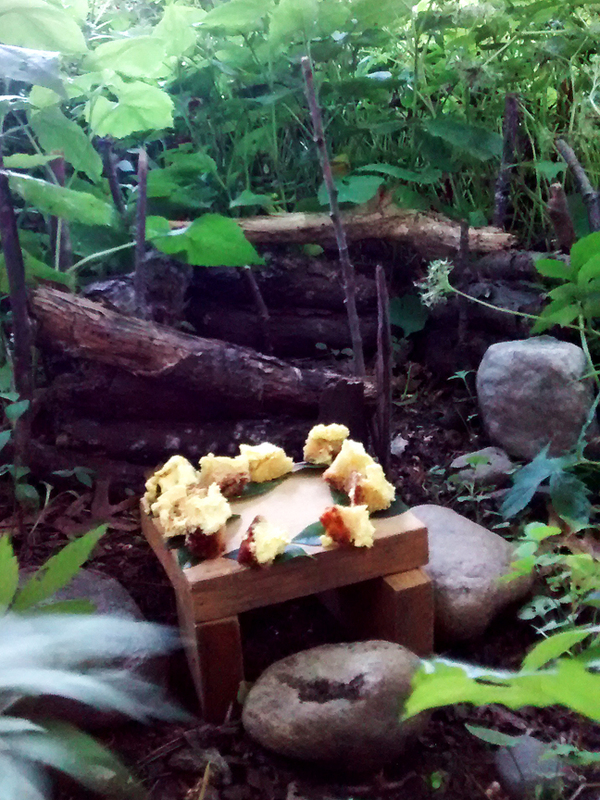 After bath and jammies, the kids decided we should leave some sun cake for the fairies too, since tonight is their big to do. We made a picnic table outside their cabin and the kids found little leaves for plates and stones for benches. My five year-old was adamant that ten fairies were going to come, so we left ten tiny chunks of cake on ten leaves for them. Hope they enjoy it as much as we did! 1) All Girl Summer Fun Band. I think I’m gonna officially make these gals the soundtrack of my summer. I first heard this song on a college station back in Chicago lo these many years ago back in aught two. Good times. I never knew the word for the second stage of dandelion flowers, when they turn into the white puffs that you wish on and blow away. But apparently they’re called clocks, and you can preserve them with hairspray, glitter, and a twig. Who knew?? My mouth is watering just watching this video. Cannot WAIT to make some of this! I’m a total windchimer. 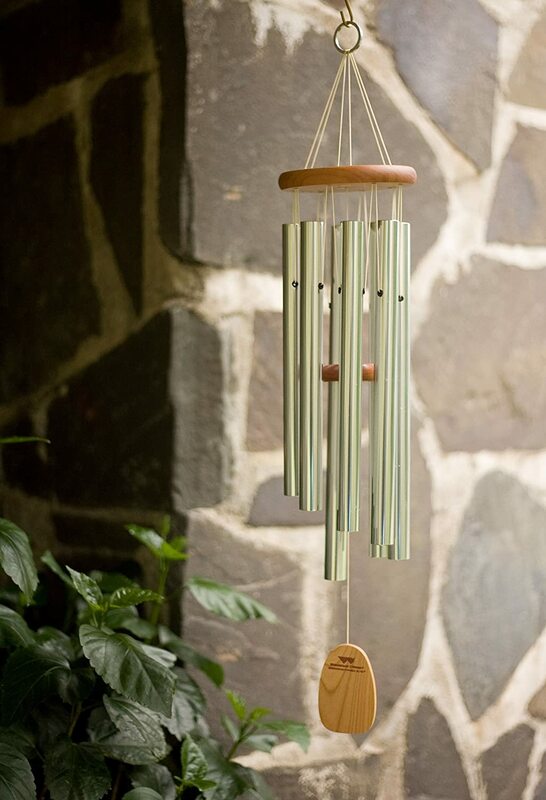 Send me into any store selling windchimes and I will be sure to swipe them all. I just love listening to all the different tones! It’s part of what lured my husband in on our first meeting. I chimed all 84 thousand of the different wind chimes for sale in the gift shop of the tiki bar we were at, and he turned red and apologized to the store manager. I would like to blame it on the flaming bowl of tropical booze we had just consumed but truthfully I would probably have done the same stone cold sober. Anyhow, I am so in love with the ethereal tones of this alto gregorian chime I found at our local Agway. Go to the link and hear it for yourself. It’s magical. Is this genius or what?? 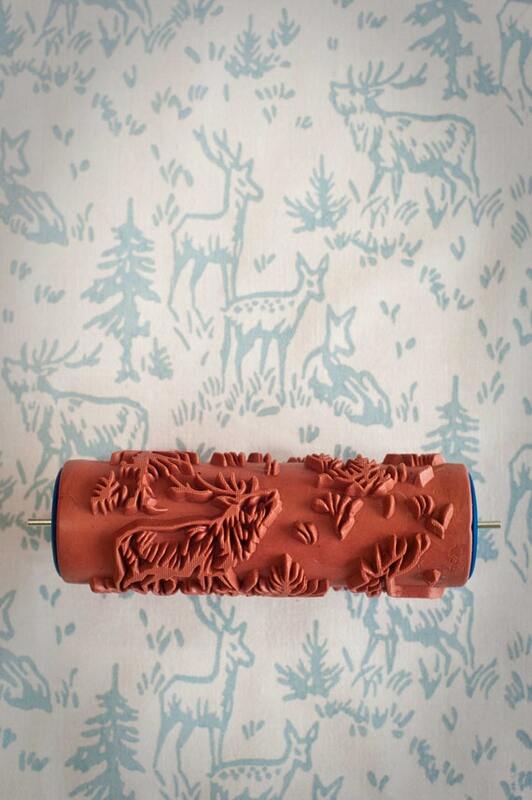 All the charm of a monochrome woodland wallpaper pattern, and none of the commitment! If we ever get around to repairing the crack-dennish walls in our children’s bedroom, I am getting one of these for sure. After years of loudly proclaiming his disinterest in superheroes, my five year old has finally begun to have a kernel of interest. As he goes, so goes his sister, and they have now become the superduo of Animaleon (who has the superpower to transform into any animal, living or extinct) and Fleaella (able to jump 50 times her own height). 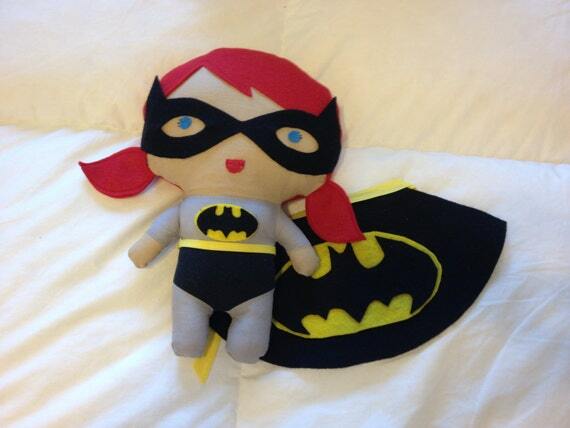 I bet they would be ultra cute superdollies. Lullatone is a Japanese band that I just adore. They classify their style as “pajama pop.” Actually their whole Summer Songs album could be a contender for my summer soundtrack too, with song titles like “Grocery Shopping for a BBQ,” “Secretly Loving the Smell of Suntan Oil,” and “Driving Home with a Towel on the Seat.” But they also have some apps and games and stuff, and I could entertain myself (not to mention the littles) for hours with this little music composition gizmo. Love.